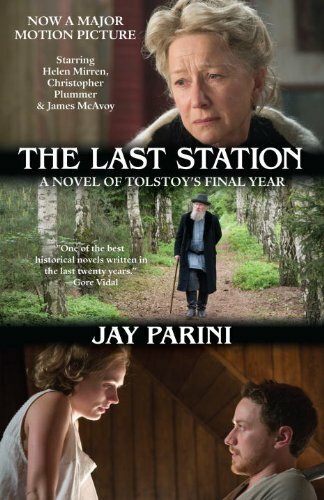 The Last Station is now a major motion picture based on the novel, starring Christopher Plummer as Leo Tolstoy, Helen Mirren as Sofya Tolstoy, James McAvoy as Valentin Bulgakov, Paul Giamatti as Vladimir Chertkov, and Anne-Marie Duff as Sasha Tolstoy. Enjoy these images from the film, and click the thumbnails to see larger images. Set in the last tumultuous years of Leo Tolstoy’s life, The Last Station centers on the battle for his soul waged by his wife, Sofya Andreyevna, and his leading disciple, Vladimir Cherkov. Torn between his professed doctrine of poverty and chastity and the reality of his enormous wealth, his thirteen children, and a life of relative luxury, Tolstoy makes a dramatic flight from his home. Too ill to continue beyond the tiny rail station at Astapovo, he believes that he is dying alone, while over one hundred newspapermen camp outside awaiting hourly reports on his condition. A brilliant re-creation of the mind and tortured soul of one of the world’s greatest writers, The Last Station is a richly inventive novel that dances between fact and fiction.